Helen Woodward Animal Center's new resale store, Orphaned Objects, is having a children's book drive. Bring your gently used or new books to the store or drop them off in the collection boxes at Starbucks or Snooze in the Del Mar Highlands Town Center in Carmel Valley! Visit the Orphaned Objects Web Page for additional information. Update May 2014: Donations are no longer being accepted at Snooze or Starbucks. Bring their books to our upscale, resale shop - Orphaned Objects - at the Helen Woodward Animal Center or call our Librarian - Suzie 858/337-7603 - and we'll pick up your books! While we've had a couple of years of OK rainfall, California appears to be heading into fairly extreme drought conditions, and the long term forecasts are currently bad. You can check out the US Drought Monitor, which includes a Long Term Drought Prediction graphic. There's also the California Department of Water Resources, which manages a page of California Reservoir Graphs. Looking at the page, you can see that most major reservoirs are well below average capacity. If you click on the reservoir names, you'll get a detail graph for that location -- for instance, click here for the Lake Shasta graph. You'll see that the levels are low and are still falling fast. There have been no calls for conservation, but if we don't get some rain, they'll be coming soon. If you ran into the Surf Cup traffic last weekend, you'll want to know that it's running again this weekend (Sat, Aug 3 to Mon, Aug 5, 2013.) Again, this is at the Polo Fields (El Camino Real at Via de la Valle), so you should avoid that area if you can! The Surf Cup is running this weekend (Sat, July 27 to Mon, July 29, 2013) at the Polo Fields (El Camino Real at Via de la Valle), so you should avoid that area if you can! Traffic can be miserable. Burlap is gone, and Searsucker is on the way. The Searsucker facebook page says that the new restaurant will open on July 17, so get ready for a new, casual eatery. (Update: For more information and reservations, call 858.369.5700.) Their website says, "Chef Malarkey has created a fantastic eatery full of local fare. The menu includes fresh seafood caught on the San Diego coast as well as locally brewed lagers and ales on tap. Friends and family can chat with chefs and servers as easily as they can with each other. Searsucker isn't a place to get away; it is a place to get together." Enjoy Father's Day at the Del Mar Highlands Town Center, where Davanti Enoteca and Mia Francesca will be searving up specials for Dads on Sunday, June 16. Mia Francesca will have a special Father's Day a la carte menu of Italian favorites for dinner. All Dads dining at Mia Francesca on Father’s Day will also receive a complimentary appetizer created by Chef Woody Benetiz. 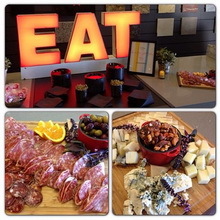 Served from 3 p.m.-9 p.m., see MiaFrancesca.com or call (858) 519-5055. Or, make Dad happy by gathering family and friends at Davanti Enoteca to enjoy a cold brew, spirited drinks and tasty bites fired up just for the holiday. 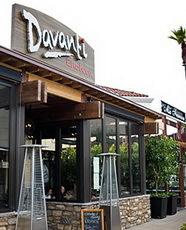 The Father’s Day specials at Davanti Enoteca Del Mar will be served all day from 10 a.m. to 9 p.m., see davantidelmar.com or call (858) 519-5060. Say goodbye to Burlap, it's closing down to be replaced by Searsucker. We hear from their facebook page, "The rumors are true! We will be closing our doors on June 10th... Thank you to everyone who has showed your support, we are looking forward to seeing everyone when we re-open our doors as Searsucker on July 17, 2013.". Read more about Say goodbye to Burlap!